"The Light" a sculpture made of weathering steel and stainless steel, sits on the end of the winding pathway on the street side of the memorial. From this corner, Hillcrest and Columbia, the memorial serves as the gateway to the campus of Concordia University. 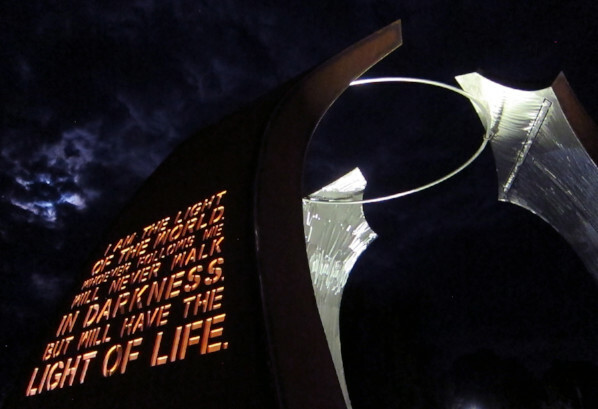 The Light is a memorial sculpture, dedicated to all families who have lost a child. It is a part of the Heartfelt Children’s Memorial Garden in Seward NE. 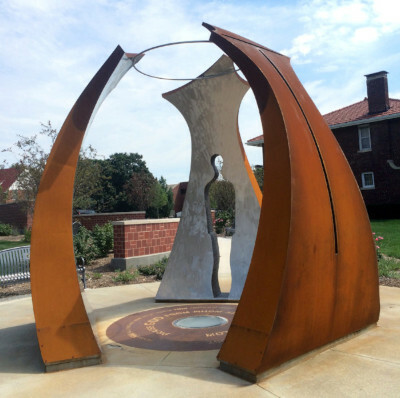 As part of the children’s memorial garden path, this public sculpture is: driven by, walked around, and entered into, as a pedestrian pause in the personal trajectory and pace of a day. At the passage of intersections it engages the community as a path, a bridge, and a gateway. Two prominent, but simple, ideas are conceptual core of the sculpture: to circle and light. A circle references cycles of life and the ongoing support those travelling through these cycles provide each other in community. Each inward facing arc finds strength as embraced and supported by the others in the circle. This is a memorial for all families who have lost younger loved ones, speaking to a collective the sculpture circles around all who have lost children. A circle is a metaphor of: infinity, the beginning and the end as one, the mystery of an eternal moment, presence or being outside time. Light evokes transcendence beyond materiality and toward the eternity of life, as reminder that those loved remain with us through time, even if not physically present. Light and silence are the language of God. The exterior weathering steel surface, produces an oxidized rusting but protected finish. Rust in color and texture reminds us we are of this earth. It is a weathering record of atmosphere and time, as breath returns to earth. The interior surface of reflective stainless steel catches and refracts light, producing an inner glow, evoking the transcendent and the eternal. The sun’s light pours down into the space during day, and at night the space is illuminated upward by light installed at its center base. The contrast of weathered steel with ephemeral reflective stainless steel deepens perception of one by the other. The circle composed of three arcs is representative in format, to the idea and structure, of the Holy Trinity. In three parts or three persons: The arc to the west, touching the sun as signifier of all creation and the “I Am”; the arc to the north, illuminating gospel scripture as “the word” and the Holy Spirit that is in and around us all; and the arc to the south holds a cut-out space referencing human form, as God in vulnerable human form, Christ on earth. All three arcs form a circle; three are one. The human space that symbolically holds Christ in the Trinity, is a space that can literally be walked through. This space also reminds us that all our loved ones are with us even if not presently visible, through Christ. The form of the human figure is visibly made known via the absence of material, in the space between. The center circle of the sculpture asks the viewer for a moment of pause. Surrounded by the strength of community, the interior space is designed to be a personal space. It invites viewers into the center for a lingering intimate experience of remembrance, reflection, meditation and prayer. The arc with a horizontal space cut at top and vertical opening in its center, back facing due west, is designed to catch the sun at the end of each day. This arc aligns to the sun, and references the symbolic, physical, and metaphysical meaning of the sun: the light and energy of the world; the beginning and the end; the genesis of all. 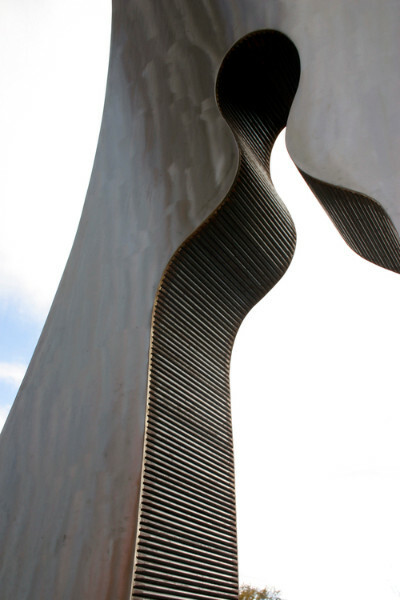 When standing at the very center of the sculpture, during the late part of the day, looking along the left edge of this west-facing arc, the sun will crest the edge of the sculpture. The arced-path of the day’s ending sun touches the edge of this form, visibly following its curvilinear contour downward, eventually moving out of sight behind the sculpture. The sun slowly reappears for a moment through the vertical portal opening at center of the sculpture; the space within the sculpture is flooded for that moment with a vertical window of the day’s light. Installed in the upper left curve of this arc-form, is a plate containing notches and corresponding month names etched along its edge marking alignment to the seasonal location of the sun. There is a marked notch for the 21st of each month. The 21st of June at the top and the 21st of December at the base, corresponding to the axis of each solstice and the continuum of the lowering and elevating in the sun’s path along the horizon of a day, changing through each season of the year. Viewed from center, the sun will crest this edge of the sculpture at a slightly different spot each day, but it will be in the same place that day of each year. This becomes a personal calendar of remembrance. 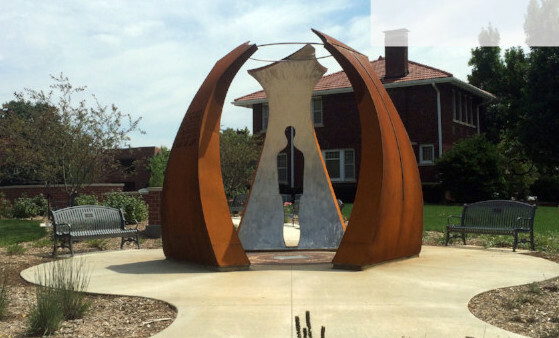 In a memorial built for all who have lost, this is the location where an individual may have their own personal interaction with the sculpture specific with an alignment to their day of remembrance.